Travelers who find themselves at this venue may encounter characters such as The SnowmanTM and The Snowdog, Raymond Briggs’ Father Christmas, or British TV characters Peppa Pig and Pingu walking around the terminals. Pictures with Santa and elves are also available throughout the airport, as well as carolers and arts and craft exhibits. Also, passengers should keep in mind that the new Terminal 2, named “The Queen’s Terminal,” is where to find a lot of the festive action: not only will live music be happening this month at Caffè Nero, but as a celebration of the terminal’s first holiday season, a 90-foot, 2-D vinyl, interactive Christmas tree will be on display until January 6, 2015, with a nice millennial twist: viewers can make the Christmas lights flash by tweeting to #T2Christmas. 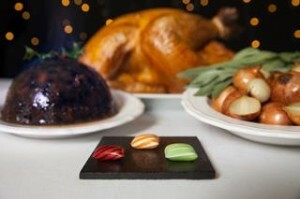 From Christmas Eve to Boxing Day (December 26), don’t be surprised to get your holiday meal cravings satisfied by free bite-sized treats – handed out to all around the airport, and aptly called “Boarding Bon Bons” – that have been specially created to replicate the flavors of either turkey, sage and onion stuffing, or Christmas pudding. This airport has been named “The World’s Best Airport” five times by the travel rating service Skytrax, and has likely outdone itself with holiday cheer this year. 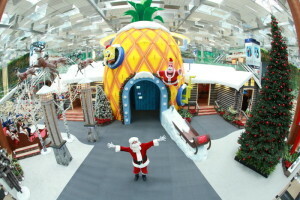 To start, a Christmas wonderland has been set up in Terminal 3, bringing to life Santa’s village and famous character Spongebob Squarepants. Travelers can either interact with Father Christmas in his log cabin, filled with mechanical trinkets, or by pedaling on Santa’s sleigh, power Spongebob’s life-size pineapple house with lights, sounds, scents, and special effects. 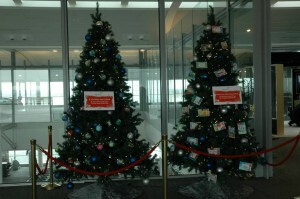 The airport is also decorated with large topiary trees of landmarks from around the world, and wandering stilt-walkers and carolers spread holiday joy throughout the airport. Lastly, Singapore’s only independent community handbell ensemble, Ministry of Bellz, will be attempting on December 21 to make history for the Singapore Book of Records by performing a 24-hour hand-bells ensemble. 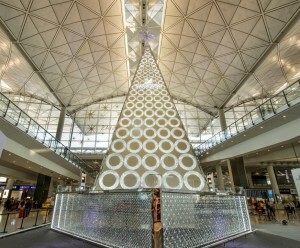 Millions of Swarovski crystals are welcoming travelers to HKG this holiday season: a 52-foot Austrian crystal Christmas tree, standing two-stories tall and spanning both the arrival and departures hall, glistens in Terminal 1. Local Hong Kong illustrator, Bigsoil, known for whimsical drawings, has brought his characters from “A Beary White Christmas” to the airport (through January 2, 2015) for kids to take pictures with and share via email or social media, using the hashtag #HKIAxmas to win daily prizes. 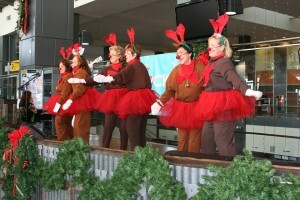 In addition, flash mobs will sing to passengers unexpectedly and a light show will be on display throughout departures. The terminals of this airport are cheerfully decorated to put you in the holiday spirit as you amble along. Through December 24, FRA will have live Christmas music performances daily in the marketplaces of Pier Z and Terminal 2; during the weekend, performances will also be in the pre-security zone of Terminal 1. Get last-minute holiday shopping done at the marketplaces that are filled with unusual gifts and great deals, and look for promoters handing out Christmas coupons as you shop. 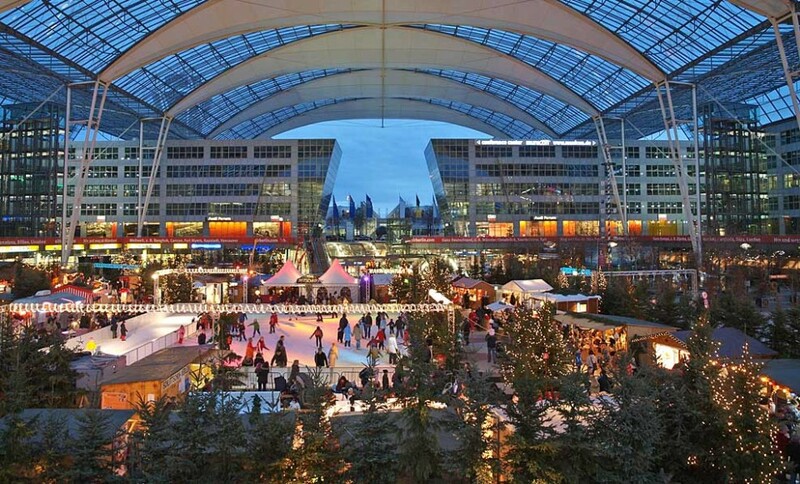 For sixteen years, MUC has turned the airport into a cheerful, winter holiday market complete with lights, decorations, and unforgettable gifts. 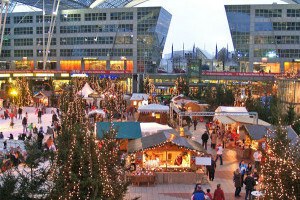 Fifty market stands are situated amongst the 300 real Christmas trees circling the ice skating rink in the center of the festival, with traditional Bavarian specialties such as mulled wine, sweet roasted almonds, sausages, and gingerbread making this airport a place to sample delectable local holiday fare. 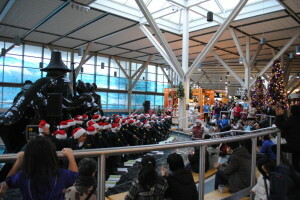 Through December 24, YVR will be decked out with performances throughout the terminals: artists include the Vancouver Opera, the Jenifer Scott Duo, Steinway Young Artist Program, and a cappella trio Silver Belles, as well as elementary school students from the area singing to passers-by. YVR is also equipped with 160 shops for picking up presents on your travels, and if you do purchase gifts here, a free gift-wrapping service is set up in the post-security area. Volunteers will be assisting with anything you may need, and there is baggage storage if you have a long wait. The airport also hosts a Mistletoe Tea (price: $49 for adults, $24 for kids ages 6-12), from 2:00pm – 4:00pm with specialty sweets, scones, and finger sandwiches. YYZ is anticipating nearly two million passengers during the three weeks surrounding Christmas, and they’re ready to entertain them: Mr. and Mrs. Claus will be wandering throughout, spreading delight by reading stories to children waiting for flights, and carolers will be singing in Terminals 1 and 3. In addition, students from local elementary schools have made ornaments to decorate eight community trees that can be seen lining the terminal. The third busiest airport in the world, DFW is anticipating 3.2 million passengers between December 17 and January 4. The airport’s “Cheer Starts Here” campaign brings in luggage porters to assist customers at Terminals A, C, and E from December 20-28. The campaign has put up giant walk-in snow globes as a backdrop for family photos, which visitors can share on Twitter at #DFWCheerStartsHere. 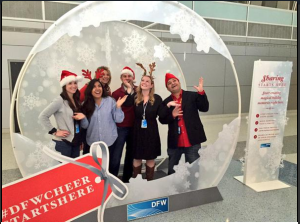 Complimentary coffee vouchers will be handed out to those who use the Airport Valet or arrive by Dallas Area Rapid Transit, and holiday helpers will be on hand to assist in a quicker check-in. 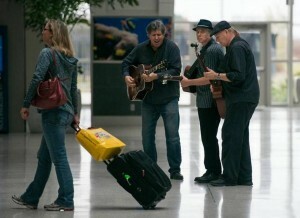 Living up to the city’s reputation as the “Live Music Capital of the World,” through December 31 Music in the Air will be hosting local musicians on the six stages throughout the terminal from Monday thru Friday (with the exception of December 24-25). This is another airport hosting local, live music during the month of December. The performances are held in the baggage claim areas of Terminal A and B, and are free to attend. Although traveling this time of year can be hectic, chances are good that if you are in one of these airports, you can take a break from lugging a big bag, and relax and reflect for a few minutes to get that last bit of Christmas spirit before the big day. Your spirits will be lifted, your time will fly by, and you’ll have some delightful, indelible additions to your holiday memories.